FCC Youth Ministry seeks to ensure spiritual growth and resiliency by encouraging participation in biblically rooted programs within our church and the Christian Church (Disciples of Christ) in Alabama-Northwest Florida Region. God has invited us to live an adventurous life of discovery, wonder, joy, and service. Youth Sunday school is now a coffee house called “Jesus and Java.” We will spend the majority of the time in fellowship but we will have a short lesson from Faith Lens based on the lectionary scriptures for each Sunday. Youth are also often involved in worship leadership, and two services per year (Youth Sunday and Mission Trip Sunday) are entirely designed and led by youth. Age: Chi Rho is for 6th – 8th graders CYF (Christian Youth Fellowship) is for 9th – 12th graders Time and Location: Both classes meet in the upstairs youth area, accessed by the stairs next to the church office between 9:15 am – 10:15 am for Sunday morning Christian education. From 5:30 pm – 6:45 pm each Wednesday (with a few exceptions here and there) youth in 6th – 12th grades gather for a fellowship meal and Bible study, games, mission projects, or purely fun activities. Friends and visitors are always welcome, but you might want to call ahead to make sure this Wednesday isn’t one of those exceptions to the 5:30-6:45 pm schedule. We take a lot of field trips! Friends and visitors are always welcome! Time and Location: We typically meet in the upstairs youth area, accessed by the stairs next to the church office at 5:30 pm. 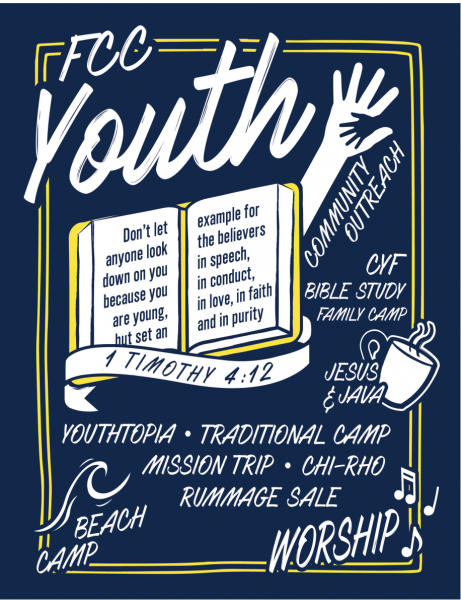 First Christian Church youth participate in camps offered by the Alabama-Northwest Florida Region of the Christian Church (Disciples of Christ) and in various in-town and out-of-town mission opportunities. Past mission trips have included tornado relief in Tuscaloosa and painting and construction in the Blue Ridge Mountains. There are also various learning and fellowship activities that are scheduled around camps and mission trip. The annual First Christian Church Rummage Sale, held the first weekend of March for over forty years, has become a Huntsville tradition. By the time the doors open on Friday morning, several dozen shoppers have lined up in the parking lot to look through the high-quality offerings. The sale concludes on Saturday with a one-hour Bag Sale, during which customers can pay $3 for all the clothes they can stuff into a paper grocery bag. Though the proceeds of the sale underwrite youth missions, the Rummage Sale is an effort of the entire church. Members store their gently-used treasures year-round, waiting for the week when they can bring in their donations. (One member generously reserves half of her garage to hold items that must be purged before the church can receive them.) While youth and parents are hard at work in the evenings and on the weekends bookending Rummage Sale week, many of the people who sort and price merchandise on weekdays have done so for decades. The people working the sale enjoy meeting the church’s neighbors and selling them needed items at very affordable prices. Mark your calendar now for the next Rummage Sale, which will be the first Friday (8:00 am-5:00 pm) and Saturday (8:00 am – 12:00 pm) in March! Contact Rev. Linda Davis, Youth Director, to ask questions, receive a calendar of upcoming activities, or be added to youth ministry communications.